Yankee Magazine Food and Home Editor Amy Traverso has a passion for apples. The Apple Lover’s Cookbook is the Windsor native’s newly published love letter to the ubiquitous fruit. Her enthusiasm began as a child, as she spent fall afternoons amidst the rolling green hills of Belltown Hill Orchards in South Glastonbury. She learned to cook at her grandmother’ Windsor Lockes home, a cheerful social hub on a block filled with fresh gardens, bustling kitchens and big family meals. 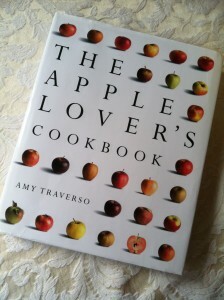 Traverso’s experiments with apple recipes have continued throughout her adult life. Opening with an indispensable guide detailing the use, origin, season and taste of 59 (yes, 59!) varieties of apples, The Apple Lover’s Cookbook also contains a wealth of information, history and cooking methods related to the beloved fall staple. I especially adore the detailed descriptions (texture, flavor and appearance )of the 59 varieties – – most of which were previously unknown to me. The highlight though, is almost one hundred mouth-watering apple recipes for every course and facet of the meal, including condiments and cocktails (many of which I have already tried with success). Accompanied by gorgeous photographs and entertaining anecdotes, The Apple Lover’s Cookbook is the ideal addition to a kitchen freshly stocked with apples from one of Connecticut’s many bountiful orchards. We tasted and talked and shared our thoughts. 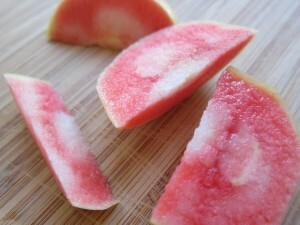 My palate exploded with the tastes of these complex antique fruits. 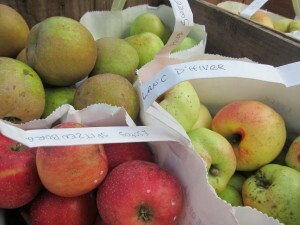 Inspired and hungry for more, I set off last weekend in search of Heirloom apple varieties grown here in Connecticut. I headed toward the Northeast part of the state, to 18th Century Purity Farm At The Hall Homestead. 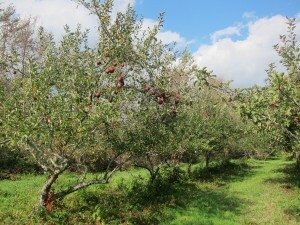 This beautiful antique orchard is owned and cultivated by Paul and JoAnn Desrochers. Hall Homestead has been in JoAnn’s family since 1830 when her great great great grandfather came to Connecticut from Rhode Island and planted the majority of the varieties that persist even today. Paul and JoAnn cultivate 88 varieties of apples at three different properties in the area- most of these varieties grow at Hall Homestead. There is a wild and timeless feeling to the fields and trees that spread across the hill beyond their farmhouse and barn. These apple trees have flourished in JoAnn’s family for generations, even surviving the devastating effects of the hurricane of 1938 in which dozens of trees were decimated. Her grandfather painstakingly reestablished the trees that still produce today. 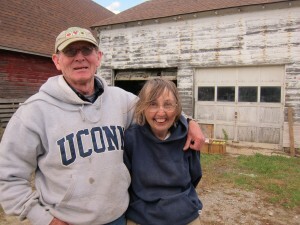 JoAnn and Paul took took over the Hall Homestead in 2008; it had declined during the preceding years was completely abandoned when JoAnn’s mother died in 2007. They have nurtured the trees back to health over the past three years, working from dawn until dusk. JoAnn grew up immersed in apples. She trained as a nutritionist, Paul as a soil scientist. These skills have been the perfect complement to their work with apples. They care deeply about the earth and the health of those who eat their fruits- therefore employing only organic methods in their fields; not a single herbicide is used. 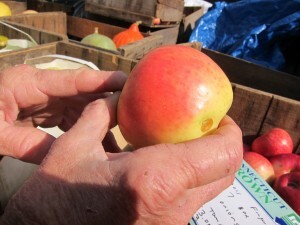 The names of the heirloom varieties on their farm have a certain moxie and musicality: Irish Peach…Roxbury Russet…The names foreshadow the tastes, which are unlike what you will encounter at your local supermarket. 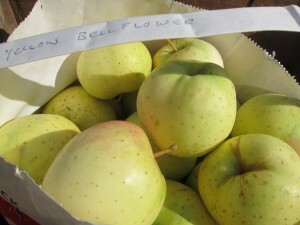 Even the ever-present varieties like Macoun and Cortland taste different at Hall Homestead, they are ancient varieties of the familiar apples, and with that history comes sublime taste. The Winter Banana is beautiful and pristine in appearance- pale yellow and deep blush or rose.Very sweet. And yes I tasted and smelled banana immediately. Very unusual and memorable. Stop. 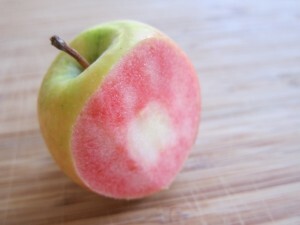 Look at this apple. The Hidden Rose is one of only a few varieties that have an exquisite pale pink flesh- at its center, a pale white color. Mine was very juicy, with a sweet flavor with a nice tart finish at the end. 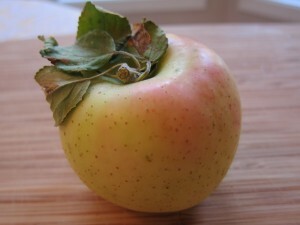 One of JoAnn’s favorites is the Westfield Seek-No-Further, a perfectly crisp and flavorful fruit. 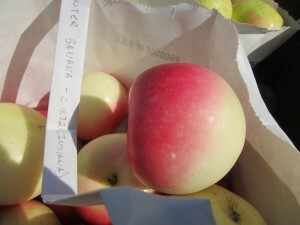 Although there are several strains of Seek-no-further apples, the Westfield, Massachusetts version is, in her opinion, the best. Amy Traverso describes its taste as consisting of “complex flavors of pear, lemon and vanilla.” Really, try it and you will taste it too. The Esopus Spitzenburg is best known as Thomas Jefferson’s favorite apple, this sweet red fruit is extremely juicy and floral. But the Calville Blanc D’Hiver may just be my favorite. I love its elegant name, and the bumpy exterior. The pale yellow green skin dappled with hints of a pale red. Very lemon-y tart and juicy, with a hint of sweetness. I imagine myself picking my Calville Blanc D’Hiver from a tree in France in the late 1500s. Parfait! My refrigerator is stocked full of bags of these beautiful heirloom fruits, steeped in history and nurtured by loving hands. With the Apple Lover’s Cookbook as my guide, I look forward to cooking and experimenting with them and the incomparable flavors they offer.